Heads up. One of the books you should be looking forward to this fall is Jeff Chang's Who We Be: The Colorization of America, due out on shelves October 21. It's about race, how we see race, and how that has and has not changed over the past half century. I've got my advance reader's copy, and it's damn good. Race. A four-letter word. The greatest social divide in American life, a half-century ago and today. How do Americans see race now? How has that changed-and not changed-over the half-century? After eras framed by words like "multicultural" and "post-racial," and do we see each other any more clearly? 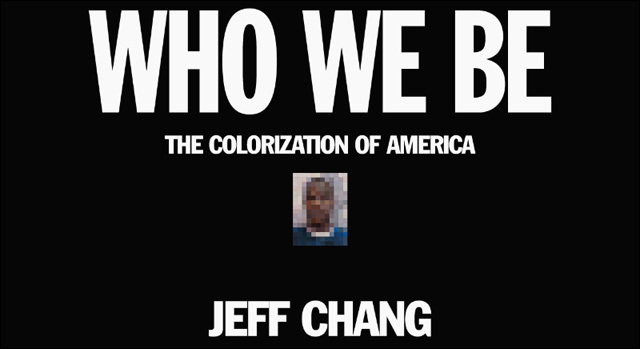 Who We Be -- Jeff Chang's follow-up to the award-winning classic Can't Stop Won't Stop: A History of the Hip-Hop Generation -- remixes comic strips and contemporary art, campus protests and corporate marketing campaigns, Martin Luther King, Jr. and Trayvon Martin into a powerful, unusual, and timely cultural history of the idea of racial progress. Jeff Chang brings fresh energy, style, and sweep to the essential American story. And, with continued headlines about race in the media every day after the recent shooting in Ferguson, Missouri, this timely book is essential reading for every American. I anticipate this book will be required reading for any student of race, culture and media. A Warm-Up Event: Hanging with Hari Kondabolu! Mark your calendars and make some plans. For further information about the book, visit WhoWeBe.net.